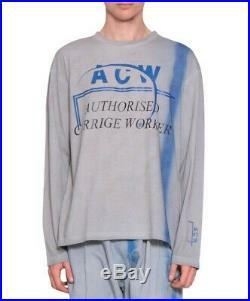 A Cold Wall ACW "Authorised Carriage Worker" Washed Long Sleeve Tee Grey / Blue. 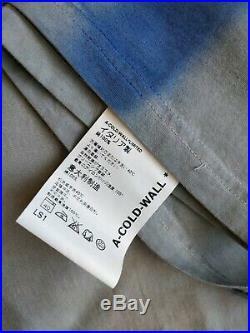 Grey dyed long sleeve ACW tee with blue dye streak and front and sleeve print. 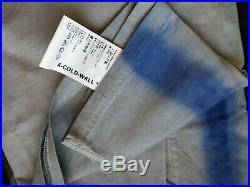 Fabric is dyed and treated so it appears worn but it is brand new. 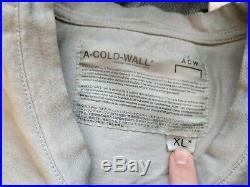 The garment tag hangs off of the back of the shirt. Size XL but fits L. Bought from Oki Ni, 100% authentic. 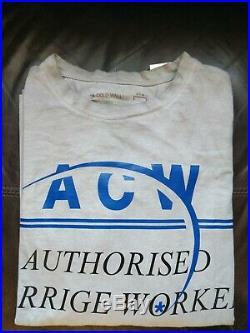 The item "A Cold Wall ACW Authorised Carriage Worker Long Sleeve Tee Grey / Blue L / XL" is in sale since Monday, March 25, 2019. 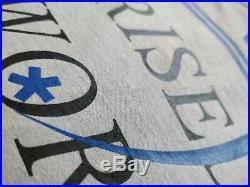 This item is in the category "Clothes, Shoes & Accessories\Men's Clothing\Shirts & Tops\T-Shirts". The seller is "charlie-98uk" and is located in Erith. This item can be shipped to United Kingdom, Austria, Belgium, Bulgaria, Croatia, Cyprus, Czech republic, Denmark, Estonia, Finland, France, Greece, Hungary, Ireland, Latvia, Lithuania, Luxembourg, Malta, Netherlands, Poland, Portugal, Romania, Slovakia, Slovenia, Spain, Sweden, Australia, United States, Canada, Brazil, Japan, New Zealand, Hong Kong, Norway, Indonesia, Malaysia, Singapore, South Korea, Switzerland, Taiwan, Thailand, Bangladesh, Belize, Bermuda, Bolivia, Barbados, Brunei darussalam, Cayman islands, Dominica, Ecuador, Egypt, Guernsey, Gibraltar, Guadeloupe, Grenada, French guiana, Iceland, Jersey, Jordan, Cambodia, Saint kitts and nevis, Saint lucia, Liechtenstein, Sri lanka, Macao, Monaco, Maldives, Montserrat, Martinique, Nicaragua, Oman, Pakistan, Paraguay, Reunion, Turks and caicos islands, Aruba, Saudi arabia, South africa, United arab emirates, Ukraine, Chile.